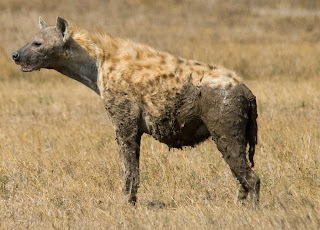 Animal Wildlife | Hyena | The hyena is a carnivorous dog-like species of animal, native to parts of both Africa and Asia. There are four known species of hyena, the spotted hyena, the striped hyena, the brown hyena and the aardwolf. Hyenas are scavenger mammals meaning that the hyena tends to eat another animals kill, rather than the hyena actually catching its own food. The hyena is well known for its cackling laugh-like scream, which the hyena is believed to use in order to alert other hyenas of a source of food. This hyena call is thought to be able to be heard by other hyenas for up to three miles. The hyena is a remarkably intelligent animal. 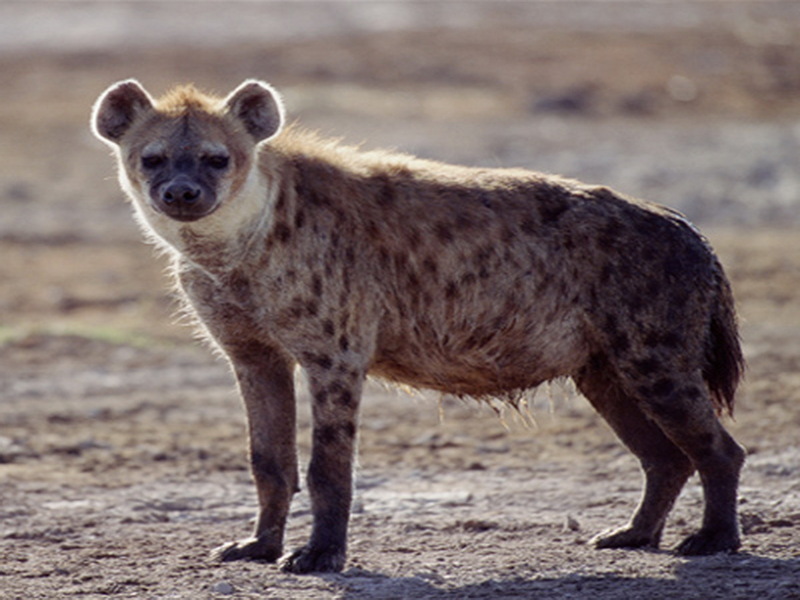 Hyenas are thought to have being compared to primates and humans in the evolutionary status of the hyenas brain. 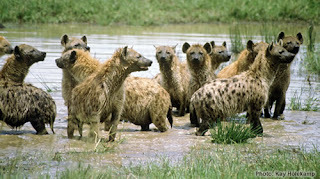 All four hyena species have a bear-like stance as the front legs of a hyena are longer than the back legs of a hyena. The striped hyena, the brown hyena and the aardwolf all have a striped mane on the top of the hyenas neck that stands up when the hyena is frightened. The main of a spotted hyena is considerably shorter and appears to stand on end the majority of the time. 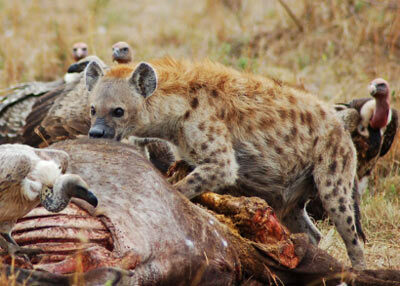 Despite the hyenas once large range across Africa and parts of Asia and Europe, all four hyena species are today found mostly in the African Savannah. The only exception to this is that the striped hyena is often seen roaming in the jungles of India, and western Asia. The hyena is said to be one of the most abundant large carnivores on the African continent and the hyena is often viewed as an irritant by other large carnivores who actually make a kill that is then stolen by a hyena pack. 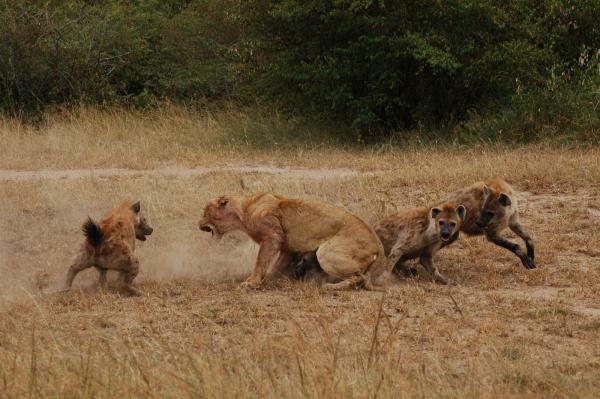 The only animal that will hunt and kill a hyena intentionally is a human being. Humans and hyenas have a long history of conflict ranging from hyenas killing livestock for an easy meal and the fact that humans used to believe that hyenas were related to witchcraft and supernatural activity, naturally making the human very wary of the hyena. 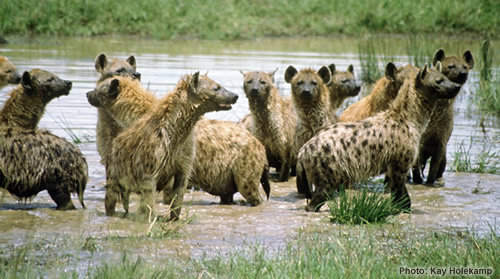 Hyenas group together in packs with the den of the hyena pack generally being in the center of their territory. The hyena pack will tend to hunt for food as a group and the hyena is exceptionally strong jaws in relation to the body size of the hyena.